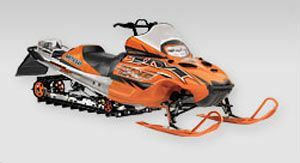 In the battle of sled vs. mountain, THE 2005 KING CAT 900 EFI RULES. In fact, the technology is so exciting, we're launching it a whole year early. From the industry-leading track length to the awesome power-to-weight ratio to the new batteryless electronic fuel injection, it's everything you need for incredible mountain riding performance. The 2005 King Cat 900 EFI. Ahead of the curve and ahead of schedule. It's good to be king.